Most people who follow fashion know the Chanel signatures very well: black, ivory, bouclÃ©, suits, camellias, black, ivory. Rinse, repeat. Karl Lagerfeld’s Spring 2010 haute couture collection of graphic white and silver was a significant departure from the Chanel aesthetic that we have all come to expect, and his Chanel Fall/Winter 2010 Haute Couture collection is yet another giant step into new territory. I hate to say it, but John Galliano’s haute couture collections for Christian Dior have been a bit repetitive over the past few seasons. The clothes have always been suitably beautiful and ornate, of course, but I left the last collection unsure if I had seen anything particularly interesting or memorable. Well. 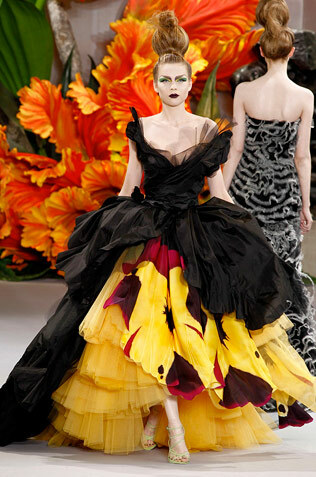 That certainly wasn’t a problem I had with Christian Dior Haute Couture Fall/Winter 2010. To finish out Paris Couture Week, I thought it might be nice to have something that’s not at all intellectual or challenging. If as many of you guys go out on Thursday nights as the people in my group of friends, then Friday morning is not the time to be looking at and making sense of Difficult Fashion. No no, Friday is the time for obvious things. To (very loosely) paraphrase the great Raymond Carver, Jean Paul Gaultier is what we talk about when we talk about couture. In a week of shows that have left me at times both dazzled and underwhelmed (Valentino, I’m looking at you), Gaultier showed up just in time to remind us all exactly why we’re here: because only a handful of people on the face of the planet are capable of so masterfully creating clothes that make us dream. I’m…I’m underwhelmed. And a little sad, maybe. But mostly confused. Is this what Valentino Haute Couture is supposed to look like? Are they serious? I think we’ve been tricked. Fooled. Bamboozled. Of the few shows that we’ve seen so far Givenchy Haute Couture felt the most like couture to me. As the line between a normal runway show and a couture show continues to blur and fewer brands present the highest of high fashion as time goes on and the customer base dwindles, I still thoroughly enjoy seeing a full-on, beads-and-feathers-and-funny-hats shindig.